First of all, props to Miss Kimball for getting me/my baby this anime-looking Eeyore for my birthday. Seriously, Eeyore meets pokemon. You can't look at it without smiling, that's why I brought it to work with me today and put it on my desk. I also brought 2 Kinder Buenos. I'm doing my darndest to set this up to be a good day. My mom called from the hospital to wish me a happy birthday. Unfortunately she timed it just so that she had time to say hello and then a nurse came to medicate her and send her back to sleepy land. She handled the anesthesia better than we thought she would. It didn't make her too nauseous, just very very sleepy for a very very long time. Plus her pain meds totally knock her out. My dad said a few minutes after she's taken them she can't say 2 words without falling asleep. Still it was nice of her to call, no? Mr. Renn took the day off, but since I didn't take the day off (oops), he's spending the morning at home cleaning my parent's bedroom and bathroom so it can be all sparkly clean when my mom comes home. Isn't he the sweetest thing EVER? He certainly knows how to work hard, and I am as lucky as lucky can be. I've decided it's smart to have lots of friends who are older than me. That way I never feel old on my birthday. I guess that works until I hit about 80. Hee hee, happy birthday to me! Happy Birthday Em! Hope the day is great and I'll bet Mr. Renn has something up his sleeve- what with you being gone all day! Hope your day is wonderful. HAPPY BIRTHDAY! And you're totally not old. In a month I turn 24, too. 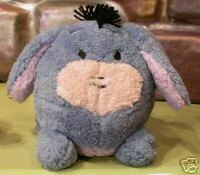 Love the anime-eyore. Too cute. Happy Birthday to my wife. She is the greatest and kinder buenos to her for working on her birthday. Love you sweetie!